12-23-10 Merry Christmas 2010 & Happy New Year 2011! Life is fun and we take it �one day at a time�. We look forward to the New Year and new experiences. During this Holiday Season, AVOC wishes for everyone a very Merry Christmas and Happy New Year. It was a year of many happenings on the local, state and national levels.The elections generally were positive and happy events for AVOC. Hopefully, we can see some course correction in Washington DC.We have witnessed the evolving terrorist threat around the world and now accept it as a ‘way of life”. On the local level, the downturn in the economy is impacting budgets, growth, infrastructure etc.The boom period of a few years ago is now a memory and will not return for sometime. Officials will be struggling with budget issues in the New Year. 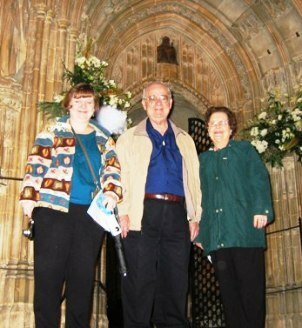 On a personal level, we entered our eighth decade of life with the attendant arthritic and other challenges.We lost a number of friends to death in 2010.We also made two trips:one to England and France in April and to New York City in September. This winter we hope to write some articles about the trips and our experiences. Life is fun and we take it “one day at a time”. We look forward to the New Year and new experiences. We have received some excellent links celebrating the season. Several appear below for the enjoyment of AVOC readers. Merry Christmas 2010 & Happy New Year 2011!! !